No matter how much we expand our product offering, it's impossible to have the exact solution for every single application. Every now and then our customers contact us asking about ways that they can modify their device to better suit their needs. One of the more common requests that we get is from customers who want to change their actuator's end tip. Fortunately, this is possible and fairly simple. All of our micro linear actuators come with a standard clevis end tip installed. Additionally, we include a threaded end tip with our hardware kit to give you a different option for mounting. Engineering a motion solution can be difficult, and it can be more so if you're restricted to using a specific actuator end tip. Over the years, we have had several of our customers build their own custom end tip solutions. This opens up a new realm of possibility as you can choose to make your tip any size and shape you like according to your specifications. You can also create your end tip from a material that suits your needs. Our stock units come with plastic tips, but you can make end tips from different plastics, aluminum, brass or whatever you like. If you want to make your own end tip, the internal thread designation is M8x1.25. The actuator end tip is screwed into the end of the shaft, which in turn is threaded onto a delrin fiberglass drive nut within the actuator. Incorrect removal or installation of the end tip can damage this nut. There are a few steps that are vital to ensuring that you do not damage your actuator while attempting to modify or replace the tip. I'm going to cover them below. Please follow this procedure closely. 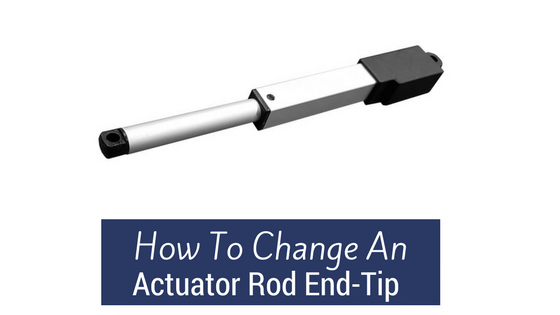 If you'd rather watch the process, here's a video on how to change a linear actuator end tip. 1. Extend the actuator to it's full outward stroke. 2. Grip the actuator shaft firmly with your fingers - It is very important to stabilize the shaft against rotation at this point. The internal drive nut inside the actuator can not tolerate much rotary force and can be broken by a firm twisting motion, rendering your actuator useless. 3. Using a screwdriver or other object, turn the end tip counterclockwise to release the tip. 4. Follow the same procedure to install your new end tip. The torque specification for the end tip is 7 inch pounds. If you do not have a small torque wrench handy, it's best just to tighten it finger tight to avoid busting your drive nut. That's all. That it! Replacing your actuator end tip is a pretty simple process that can help simplify your design and meet your specific goals. Need help with choosing the best actuator for your project? Give us a shout at sales@actuonix.com or call us at 1-888-225-9198.